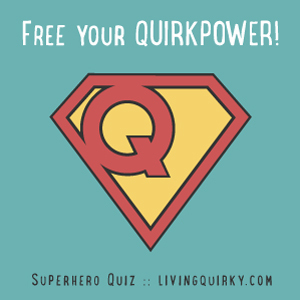 Hi, Christina here, founder of Living Quirky. I’ve been in the personal / business development industry for over 10 years. Frankly, I’m bored of it all. I’m bored of hearing the same offers over and over again about finding your authentic voice, breaking through your limiting beliefs, and discovering what you’re meant to do in the world. Which is why I created something different, for those who think differently. Most online programs include step-by-step modules and forums where others give you advice. For us quirksters, “how to” linear processes are like straight-jackets, and the last thing we need is more advice from others. A non-linear, inside-out approach to growth. Instead of informational modules that fill up your brain, you’ll get real world missions that give you immediate data and insights about yourself. Instead of a bunch of other people telling you what they think you should do, we practice curious questions and reflections so that you can see deeper into yourself to find your own answers within. Instead of one person’s guide to XYZ-whatever-you-seek-to-get, there’s a diverse collection of many ways of exploring and creating and being in the world. If you are still looking externally for the answers, have no fear, the alliance is here! Imagine… yoda and peter pan collaborated to design a choose your own adventure style experience. And then!… you and a group of 11 other people embarked on their own adventures and everyone shared stories and cheered each other on. So not only did you all get to have awesomesauce adventures, you didn’t have to do them alone! Quarterly membership, renew for more adventures with us or step out anytime you’re ready for your next adventure elsewhere. 2 monthly missions, or choose alternatives from the adventure archives. Monthly group call for individualized support on your missions, discoveries, and challenges. Up to 12 participants, with access to a community “Slack” group to share, inquire, and reflect. *This is the beta test pricing, will likely go up later this year. Looking to add more color to your world? Tired of being surrounded by others who don’t “get” you? Wanting to strengthen your quiet inner voice speaking your deep truths? Feel like your practical mind and your wild heart are in a heated debate? Seeking to step off the paved path and explore new terrain? Sense you’re meant for something else, but unsure how to find out what it is? Desiring more creativity, and feeling more fully alive? The Adventure Alliance might be just what you’re looking for! The alliance is curated to ensure diversity and shared values. Currently accepting applications, apply HERE.